Air Conditioning, Power Windows, Cruise Control! This Chevy Silverado 2500HD is an honest, uncompromising heavy duty pickup truck that can handle just about anything. 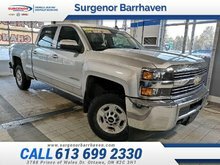 This 2018 Chevrolet Silverado 2500HD is fresh on our lot in Ottawa. 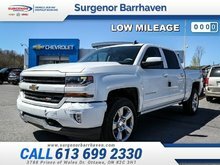 Get the job done in comfort and style with this 2018 Chevrolet Silverado 2500HD. Chevy trucks have a track record of capability and dependability and that's no different in this heavy duty pickup. It can do the big jobs while displaying good road manners around town and on the open road. This truck demands respect wherever it goes with a powerful engine and a rugged style. 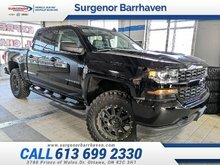 This Crew Cab 4X4 pickup has 31280 kms. It's white in colour. It has an automatic transmission and is powered by a 6.0L V8 16V MPFI OHV Flexible Fuel engine. This vehicle has been upgraded with the following features: Air Conditioning, Power Windows, Cruise Control. It has some remaining factory warranty for added peace of mind. Our Silverado 2500HD's trim level is Work Truck. WT stands for Work Truck and this 2500HD is one of the hardest working trucks on the road. It comes with features like a heavy-duty automatic locking rear differential, a corner step rear bumper, recovery hooks, tailgate and bed rail protection caps, an AM/FM stereo with a 4.2 inch color display, a USB port, and aux jack, cruise control, power windows, power locks, air conditioning, and more. Buy this vehicle now for the lowest bi-weekly payment of $297.99 with $0 down for 84 months @ 6.99% APR O.A.C. ( Plus applicable taxes - Plus applicable fees ). See dealer for details. 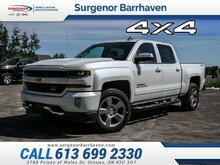 Interested in the 2018 Chevrolet Silverado 2500HD Work Truck - Power Windows - $297.99 B/W ? $35,995 * Plus HST and licensing. Freight & Fees Included.